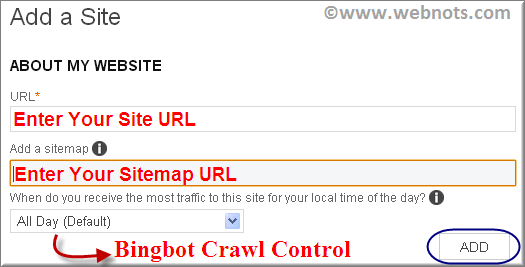 Home » Website Building » SEO » How to Add and Verify Your Site in Bing Webmaster Tools? How to Add and Verify Your Site in Bing Webmaster Tools? Bing is the search engine used by both Bing and Yahoo! having over 10% of search engine market share. You can submit your site to Bing anonymously as well as through Bing Webmaster Tools account. This article explains how to add and verify your site in Bing Webmaster Tools and various verification methods available. Learn more about anonymous site submission here. It is highly recommended to have registered account in order to make use of all the features available in Bing Webmaster Tools. Click here to register for a free account. You can also login to your account using Microsoft’s account like Hotmail or Windows Live. Once you logged in to your account, you can see an “Add a Site” box. Enter your site URL and click on the “ADD” button. Remember to enter the correct URL with WWW or without WWW, since they are considered as two different sites from Bing’s perspective. Click on the “ADD” button once you entered the required details. Bing Webmaster Tools will provide you three options to verify your site. Download the BingSiteAuth.xml file under the option 1. Upload the file in your site’s root directory. You need to have an access to your site’s root directory in order to upload a file. Check your file upload by opening the URL “http://example.com/BingSiteAuth.xml” in the browser. (Replace example.com with your site name). This is the simple and recommended method which does not require access to your site’s root directory. Copy and paste the HTML meta code in your site’s header section. You need to paste the verification code in each individual pages of your site in order to help Bing to crawl and provide more accurate information about your site. Once pasted the code publish your site and then click on the “Verify button”. In this method again you need to have an access to your site’s DNS settings. Add a CNAME record as given in your verification screen and point it to “verify.bing.com”. If you are not sure how to do this, then select the DNS provider from the list and then Bing search will help you with the related search results. DNS changes may take up to 48 hours to propagate, hence you may need to wait sometime if your verification is failed. Once your site is successfully verified, you can see a message in the same screen next to “Verify” button. You can also “Cancel” the verification and do it later any point of time. 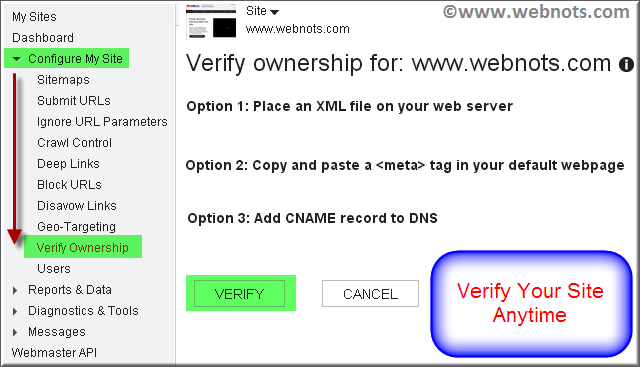 If you want to change the method of verification for already verified site then you can go to “Verify Ownership” option available under “Configure My Site” section. Site Dashboards will show all the sites added in your account. You have an option to click on the unverified site to verify it as explained in the above section. You can select any site or all the sites and delete from your Bing Webmaster Tools account. Note deleting or adding your site in Webmaster Tools account will not affect your site’s ranking in search results. Tried for several hours now but nothing seems to be happening. please any other easier way of doing this? I’m just getting pissed off. Sorry anyway! There is no meta tag or xml file on your site. If your trying with CNAME entry, DNS propagation may take up to 48 hours. So try after some time. Thanks for your replies. I appreciate. Hope you have added your site successfully. what about adding both (with www and without www)?? I have done it in Google Webmaster!